Forbidden Drive at Fairmount Park. The Philadelphia area's ever-expanding Schuylkill River Trail is becoming as much of an attraction as it is a local fixture, earning national recognition and major investments for future growth. This year, Pennsylvania is giving a special designation to one local trail that links up with the SRT by way of Lincoln Drive. The Department of Conservation and Natural Resources named Fairmount Park's Forbidden Trail the best in Pennsylvania for 2018 earlier this week. Forbidden Drive, also known as the Wissahickon Valley Park Trail, runs five miles along the Wissahickon Creek, past a series of local landmarks, from Cedars House Cafe to the Thomas Mill Covered Bridge and Valley Green Inn. Designated a National Recreation Trail in 1975, the territory of Forbidden Trail was once the hunting and fishing grounds of the Lenni Lenape. Taverns and roadhouses later surrounded network of mills along the Wissahickon Turnpike, which is now Forbidden Trail. 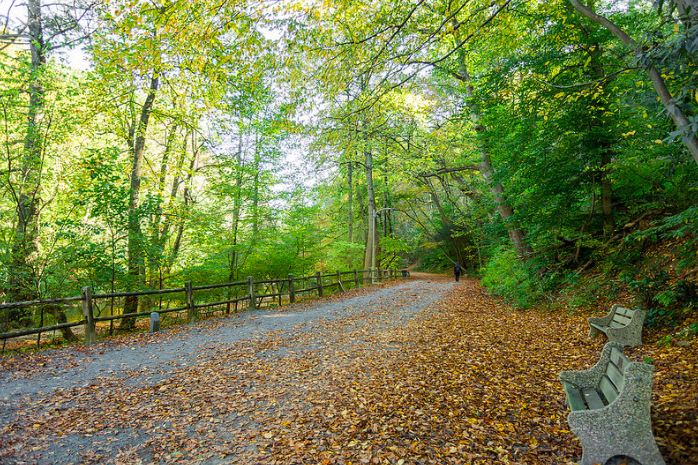 "We're thrilled that the beautiful and historic Forbidden Drive has been named Trail of the Year," said Maura McCarthy, executive director of Friends of the Wissahickon. "The name belies this urban oasis that welcomes visitors of all ages on foot, bikes, or horseback to enjoy the wonders of nature that Friends of the Wissahickon work to conserve."